The full length of the parking lot! From the "slings and arrows of outrageous romance"
You know - "Neither a borrower nor a lender be"
Is your silence that golden? Or is it the bars on your prison? Are you gagged by your ribbons? Are you really exclusive or just miserly? This song is about Joni's travels with the Rolling Thunder Review, and her frustration that Dylan briefly spoke to her twice. She wanted a real conversation. 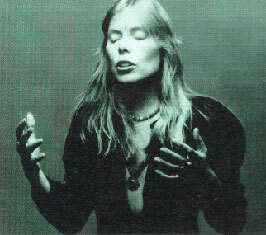 See Yaffe's Joni biography, p. 202. I love this song! The arrangement is so simple yet effective, and the lyrics are both tongue and cheek hilarious and thought provoking! Joni is great! I still remember shutting myself up in my room when the Court and Spark record came out!